From 1914–1918, millions of brave men and women around the world left their homes to fight for their countries in the Great War. It’s likely that someone in your family tree was among them. Do you know their story? Draft and service records from World War I can be a rich source of information about your ancestors, including physical descriptions, vital information, and details about their involvement in the war. Discover the part your ancestor played in the war to end all wars, preserve their legacy, and find out how it lives on in you. Discover your relative’s WWI draft card. 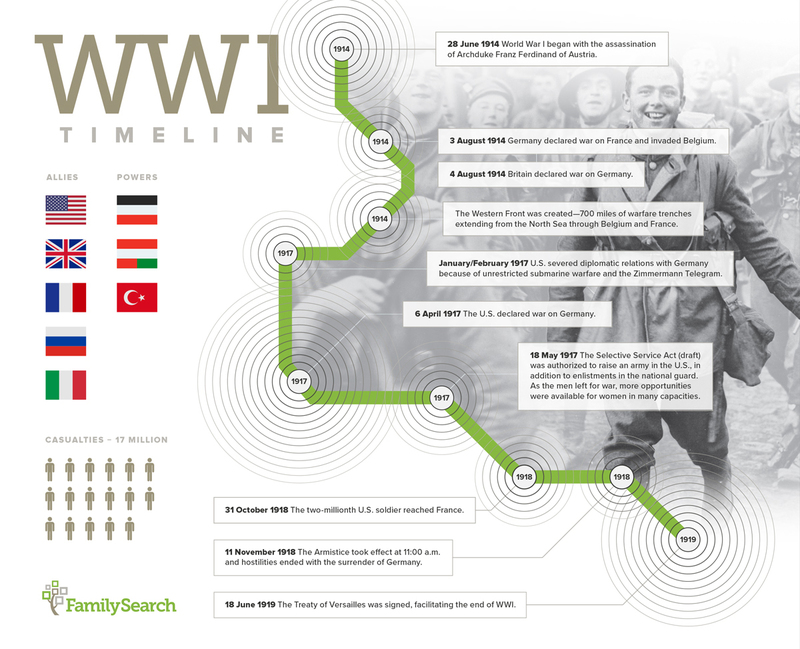 Find out how to uncover and share your WWI ancestors’ stories with records on FamilySearch. November 11, 2018 is the centennial of armistice, which marked the end of World War I. Military records can provide insights into your ancestors’ lives and the lives of those around them. Learn about some of the most valuable WWI records with this presentation from RootsTech 2018. Poppies are a symbol of respect and remembrance of those who died in World War I. There are plenty of records available to help you learn about your ancestors who fought in World War I, including draft and service records, local newspapers, burial registers, and more. If you know where your ancestor was from or what unit they served in, you can look for them in United States World War I State and Local Histories or United States World War I Unit Histories. Dive into FamilySearch’s collections to see what you can discover. Or, help others find their ancestors by helping to index WWI records. Find more information about United States World War I military records. World War I began on July 28, 1914, when Austria-Hungary declared war on Serbia after the assassination of Archduke Franz Ferdinand. Russia and Germany soon joined the conflict, followed by Britain, France, and Italy. On April 6, 1917, the US declared war on Germany, and 2.8 million men were drafted to fight. Over the course of the next eighteen months, more sixty million troops worldwide and 4 million US troops were involved. By the end of the Great War on November 11, 1918, the violence across Europe resulted in an estimated thirty-seven million casualties and more than sixteen million deaths (including both civilians and military personnel). One group of men who served on the front lines was the 369th infantry of the 93rd division, a group of African American soldiers better known as the Harlem Hellfighters and Men of Bronze, nicknames given to them by the French. These men were known for their fierce combat, fighting longer and harder than any other infantry. The tenacity and toughness of the Harlem Hellfighters continue with us today as we remember and honor their lives and the lives of all who valiantly served in the military. More than 50,000 military dogs served in World War I, including the famous Sergeant Stubby. World War I was the first war in which military dogs were mobilized on a massive, organized scale. You can download and print this poster and rack card to spread the word and invite others to honor and remember those impacted by WWI. My mother was born in Germany in 1910. My father’s parents were born in Germany in the 1800’s. I know one of my first cousins belonged to the Hitler Youth. This was not voluntary for him. How do I find out about the other side of the story? About any of my family that might have fought on the side of the Germans? I am grateful for any information I can get on my relatives, this is sure to help in finding some of my family that might have been in or effected by the war, since all of my family is mostly in one or more of the military our heritage seems to reflect the military so much. Thank you again. Hello, any suggested sources or individuals with strong familiarity and knowledge of the Gorrells History of WWI records to seek consultation or advice research would be appreciated. I have obtained a number of documents although looking to obtain insight on interpretation and/or other means to retrace relative’s assignments, actions in WWI. Thanks in advance. I was glad to find my father’s draft card, but disappointed that there was no information that we could use to help in our search.